Bathrooms get used frequently, and this can wear them out quickly. An out-of-date bathroom drags down your home’s décor, so if yours could use a touch-up, call or come to us for bathroom remodeling in Enid, OK. We offer everything you need to make your bathroom more than just functional. With our touch, it can provide as much personality as your bedroom and boost your home value in the process. We can also make it fit your growing family, utilize storage space to the fullest, or look like it belongs in a fine hotel. One of the best benefits of our remodel process is our custom showers. No more cramped quarters or struggling to find a place to put your soap, shampoo, and razor. We design a shower that’s made for you and fits your exact needs. You could even opt for a walk-in model just like you would find at a fancy hotel. 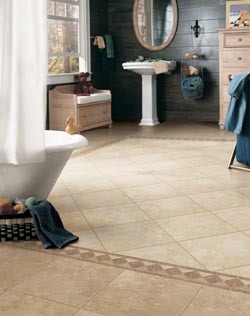 Pick from our porcelain or ceramic tile showers for a look that blends in with the rest of the bathroom. Other businesses may offer some services and not others, but we’re proud to say we do it all. Cabinets, vanities, tile, showers, backsplashes; everything you need is right here at our store. We work with you from conception to construction and installation to make your bathroom fit your growing family or your personal preferences and interior design themes. You can expect individualized design services with brand-name products to bring out the best of your bathroom and make it shine. Even if you aren’t sure what you want it to look like yet, our home renovation contractors are happy to offer inspiration. We’ve remodeled bathrooms of all shapes and sizes, so we know how to realize the full potential of every square inch of your space. Have you ever imagined what your ideal bathroom would be like if you could design it however you wanted? Our service gives you the chance to make that a reality. Now you can enjoy bigger cabinets, an extra sink for your spouse, a new tile pattern, or a more spacious shower instead of a tub you don’t use. We design and build according to your wishes and do all of the hard work while you reap the reward: a bathroom that’s exactly how you want it to be. Contact us for a free consultation on beautifying your bathroom. We remodel and renovate throughout Enid, Covington, Billings, Lamont, and Pond Creek, Oklahoma, and the nearby communities.